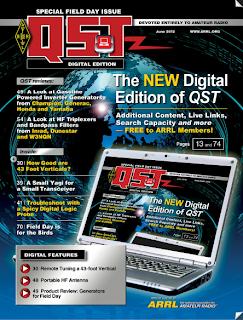 The new digital QST edition is now on the web, accessible to ARRL members. It's a good effort -- at least if you like the new web magazine reading experience. It is being provided to members as a no-extra-cost addition to the traditional print version. I hope the pdf version won't go away completely. 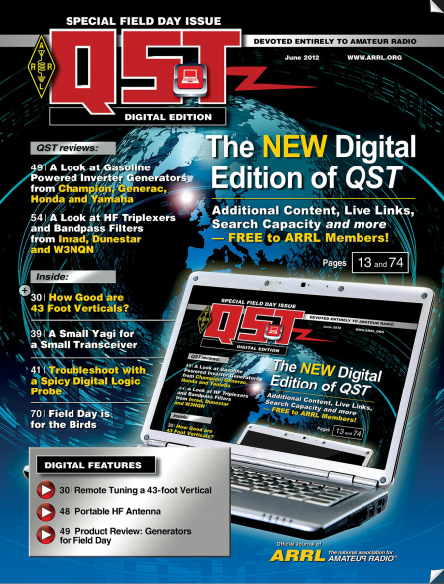 That's the format that appears on the annual publications CDROM and on the QST web archives up through 2011. The new format is fine (well, if you like it!) for on-line reading and limited off-line reading, too, but it is a proprietary and DRM-restricted format that probably won't be convenient (if readable at all) 50 years from now. This is the classical logo for me. Its block lettering and at least some of the lightning bolts continue into the modern era. The slogan now says "Amateur Radio" instead of "the Wireless Amateur". I like this old graphic, but I'm pleased that there is so much continuity in today's version. Bold and hyperactive design, and presented twice for good measure!